MulTEA is part of the Weatherization Assistant, a family of easy-to-use but advanced computer audit software programs that select energy-efficiency retrofit measures for homes to be weatherized. 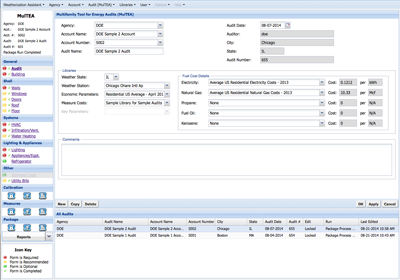 MulTEA is an energy audit tool designed for use with multifamily buildings that is intended to provide auditors with an improved energy simulation tool as well as an improved tool to identify the cost-effective energy-efficiency retrofit measures. MulTEA is a DOE-approved multifamily audit tool specifically designed to help states and local weatherization efforts implement the U.S. Department of Energy's Weatherization Assistance Program. It is also used by utilities and other home energy professionals. In support of this project LBNL created a new multifamily version of the HES API which uses the DOE-2 hourly building energy simulation program together with supplementary engineering calculations to estimate the annual energy use and potential energy savings of weatherization retrofits. MulTEA uses this API to estimate the heating, cooling, lighting, and appliance energy consumptions of a building. The assessment takes into account local weather, building heat losses and gains, internal gains, building air tightness (e.g. from a blower door test), and allows users to enter whole building electricity and fossil fuel energy bills to manually calibrate the building model.